Then I Got To Thinking...: 200 is my lucky number! ok ryan is adorable in his tuxedo. he is going to be a heart breaker. and i have never seen shoes more uncomfortable in my life! Those are totally CRAZY! If you do wear them, make sure to take a picture. They look extremely uncomfortable, haha. I think stilts may be more comfortable! You must be over the moon with excitement as the wedding approaches! I hope those are sky high roller skates! Those shoes are hysterical and RyGuy looks adorable. Happy 200th and here's to many more!!!! Those shoes are hilarious! And Ryan is too cute! those shoes are ridiculous! ha the tux is bad a though. he looks so cute! Wow those are some crazy shoes! I don't think I'd be wearing them ever!!! Congrats on the 200!! :) And RyGuy is SOOO adorable!!! Aww!! :) And those shoes...wow.. Just ridiculous! They make that poor woman's calves look fat but they're likely not... *nervous* And I'm so clumsy, fairly certain those shoes would be the death of me. I fell and broke my back walking down stairs last year...in flip flops. Sooo uh.. yeah. haha! YAY!! Congratulations on 200 :) he is sooooo cute!!!! ummm not tooooo sure about those :) heheh Hope you have a great weekend! happy 200!!! well deserved my friend. your nephew looks too flippin cute.ahhh...i die! and wow...those shoes are deadly. i hate being short but uh yea no. I dont know how that girl is walking in those, nevermind standing on one foot! Whoa those shoes are crazy! Wow. haha. Oh my gosh those shoes! My husband is 6'3 and I'm not even 5'2 so I could probably use those but... wow. Congrats on your 200th post and 200 followers! I love reading your blog! Those shoes are ridiculous...People wouldn't really wear those...right? Ry Guy IS the cutest thing ever, next to my little man of course. Ah ha. Congrats on the milestone! Those shoes look like torture devices! At 5'11 I most definitly would not be wearing them. Your nephew is such a cutie in his little tuxedo! wow - those are the craziest things I've ever seen. They're little chairs right? Yay for 200 and 200! I love your blog and I'm so excited for you!! Ry Guy is SO ADORABLE!!! Those shoes look so scary! Us shorties gotta stick together ha! I've actually seen those shoes before. Hell to the no, haha. And hi Ry Guy, you might just be one of the cutest babies ever. Congrats on 200 friends and 200 posts!! All so exciting!! And Ry Guy is going to steal the show in that little tux... and those shows are interesting, but I doubt I would wear them. I can barely walk in anything over 2 inches, so these would spell trouble for me for sure!! What a sweet little guy in the tux! He is so cute! First off ~ I could eat Ry Guy up in that tux ~ he is the cutest thing ever! 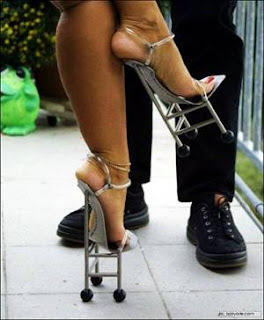 As for the shoes - cool concept although I do not think that they would be that comfortable ~ fun for a minute and a picture. Maybe you could wear your other ones for your walk down the aisle, then put those on for the ceremony and then change again for the walk back! Ry-guy... How danged adorable is he! Best wishes to you next weekend my dear!! the shoes (if you can call them shoes) are hideous yet funny!! ha! my fiance and i are the same way, he is over a foot taller than me. i love it though. hope you are having a great weekend pretty girl! Congratulations on YOUR 200 posts and followers!!!! OMG! Ry guy is sooo ADORABLY FASHIONABLY FABULOUS !!! Aww, Ry-guy is beyond adorable, that is so sweet! Congrats on 200 followers, yahoo!!!! Congrats on 200 posts! Ry Guy is so adorable and those shoes are crazy looking!